﻿ Folding Gates – Make that a Double? Blog Home > Docks & Shipping > Folding Gates – Make that a Double? Folding Gates – Make that a Double? Folding security gates are one of the top selling products we carry – and for very good reasons: they protect access points like dock doors and personnel entry areas, and help prevent theft or vandalism. They also allow air flow through a facility while still providing a secure environment. Have you ever considered why you might choose a double folding gate over a single gate? 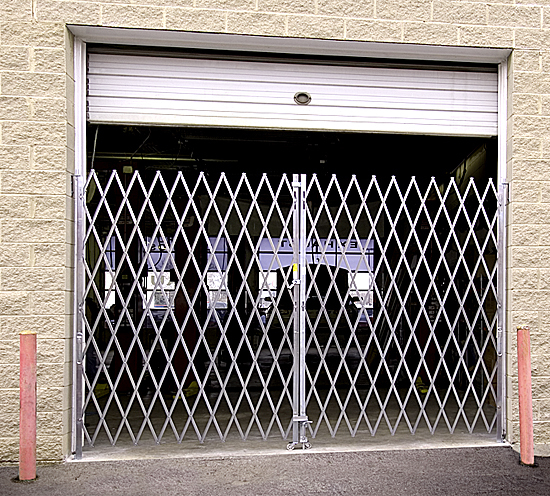 Most single folding gates (meaning one panel of the accordion style gating) are sized up to 12′ wide and take less effort to open and close than double gates. Why? Because with a double gate, you make two trips to completely open or close it (or need two people), whereas a single gate takes only one trip to open or close (and one person). Also, they are often more rigid – primarily because of their smaller span capability and the fact that they lock on an edge, not in the middle. That means less chance for a thief to push under or lift the bottom of the gate to gain access. 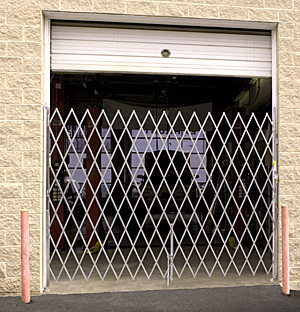 Double folding gates are necessary when your opening is 12′ or more, and the center point where you bring the two gates together will most likely have a drop-down post that fits in a hole in the floor and locks securely to prevent flexing the gate sufficiently to gain access. If the span you need the gate to cross is very large, there may also be posts at the mid points of each panel – again to prevent flexing of the gate for gaining access. So, if you’re considering folding gates to secure dock doors, entryways or windows, think about how wide the gate needs to be and whether you really ‘wanna make that a double’. A single gate may be just fine, and will save you steps and time whenever you use it.